Google and Apple made headlines earlier today, but not in the usual manner (okay, maybe in the normal way, depending on what circles you hang around in). Folks noticed an image of an Android peeing on an apple. While there's nothing inherently offensive about peeing on an apple, the giant chunk of fruit missing implies that this is Google's mobile platform taking a shot at a well-known competitor's. The thing is, Google had nothing to do with this. You see, Google Maps is largely accurate in part because it relies on the contributions of people in local communities to update information themselves. While the company is supposed to keep tabs on what gets submitted, obviously some things slip through the cracks. Want proof? 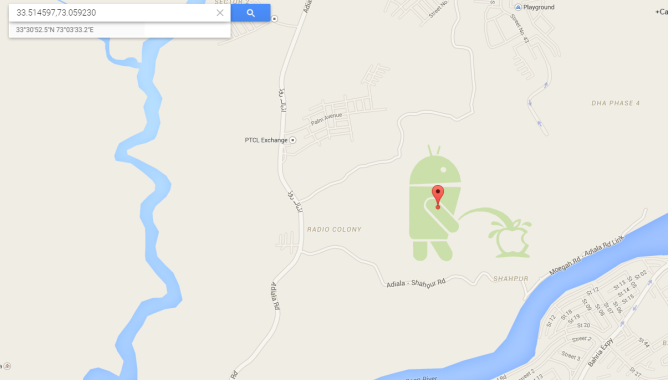 Here's another image that appeared not far from the peeing Android, and we can feel pretty certain that Google had nothing to do with this one either. Google has since removed the images, but if you want to confirm for yourself, here's where you could previously find the Android, and here's the former home of the quip about Google's review policy. Both were located in Pakistan. "We’re sorry for this inappropriate user-created content; we’re working to remove it quickly. We also learn from these issues, and we’re constantly improving how we detect, prevent and handle bad edits." Google's Mara Harris, in a statement to the Washington Post. According to Gawker, the peeing Bugdroid was the work of a user named nitricboy. Previous work includes a pond shaped like the Skype logo and a Pepsi logo inside of an Islamabad hospital. None of these are particularly inflammatory, nor creative. So there you have it. As much as some people would love to see Google take explicit shots at Apple, this was a user-submitted prank. It's gone now. Nothing to see here.